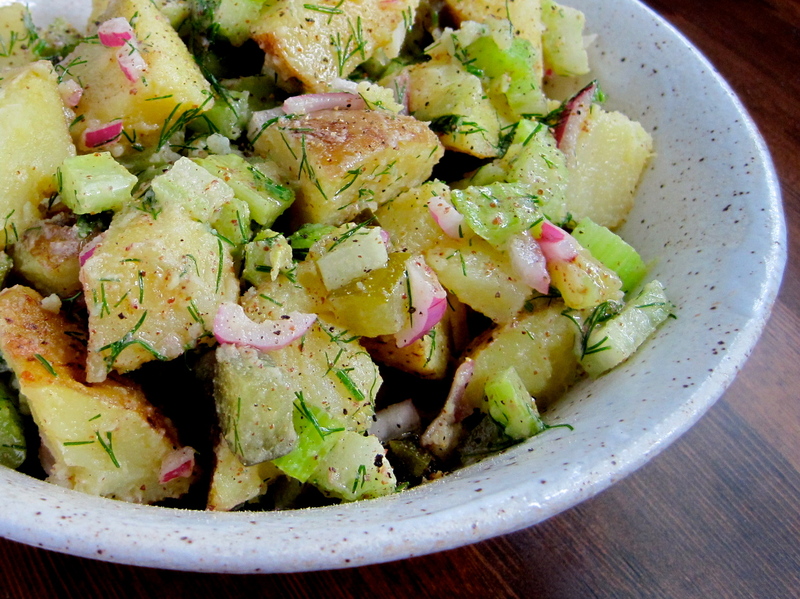 The addition of pickle juice is what sets this potato salad apart. I use a vinegar-free and preservative-free kosher dill pickle that has garlic and dill in the ingredients. The brand is Bubbies, and I’m a fan because (a) they’re really, really good and (b) they don’t have vinegar, which normally overpowers the average pickle (for me). They have a fantastic zing and a delicious garlic flavor. If the pickles you are using lack garlic, you might want to add a minced clove or two to taste. For this salad, served right away at room temperature, straight from the fridge, or on a paper plate in the afternoon sun are the best ways to enjoy it. Without having to worry about the mayo, it makes for the picnic side dish. Put the potatoes in a saucepan and cover with water by about 1-inch. Bring to a boil with 1 teaspoon (5mL) of the salt. Reduce to a simmer and cook until potatoes are tender, about 10 minutes. Drain and cool for about 10 minutes. Put the pickle juice, mustard, remaining salt, and a few grinds of black pepper in a large bowl. Add the oil in a steady stream, whisking to emulsify. Mix in the onion, dill, celery, and pickle. Once the potatoes are cool, add them to the mixture. Toss to combine. Refrigerate until serving or packing for a picnic. Oh, this looks super yummy! I am sure this will be a hit at our next family gathering at the cottage. Personally, I have never been a fan of the thick mayo potato salads. I love the thought of one with pickle juice, a pickle and some fresh dill. Thanks for the recipe. 🙂 (I love Bubbies pickles, too, btw). I joined wordpress years ago. When my passion hadn’t yet succumb to the responsibility of posting. When the thought that blogs ran themselves and posting everyday seemed realistic. But today, here I am logging on to start yet another blog that I have high hopes for, and I stumble on yours. By stumble, I mean that yours is the only one I’ve subscribed to. So when I log in – I see all your amazing things an adventures. As a stranger to you, and a compliment in it’s purest form – I adore your blog. And you. In many ways it fuels my desire to keep plucking away at my keyboard. In other ways, it reminds me that people are passionate in so many different way. I just happen to respect yours immensely. I hope I poured if even the smallest bit of todays mug of happiness that you can sip on. Because you surely add a lot of inspiration and joy into mine. Sincerely, Rosemary from sunny San Diego. Thank you so much! That is very kind of you.